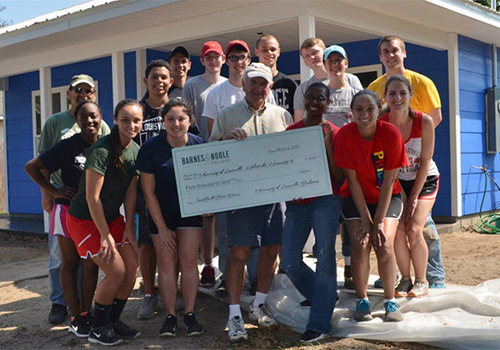 University of Louisville students stand in front of the house they helped build in Lake Sumter, Florida during their spring break. While thousands of students across the country spent their Spring Break lounging by the pool or developing a tan, students from the University of Louisville and Columbia University Habitat for Humanity Campus Chapters volunteered their time swinging hammers, spackling wallboard and painting siding. Last month, the Louisville and Columbia Habitat Campus Chapters were named winners of the Barnes & Noble College #InstaBuild Video Contest. 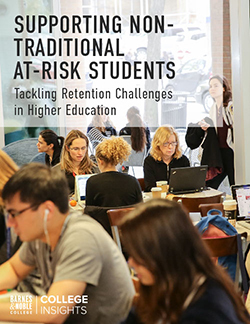 Their winning entries earned each group $5,000 to cover expenses for their Spring Break Collegiate Challenge trips to Lake Sumter, Florida, and Lafayette, Louisiana, respectively. 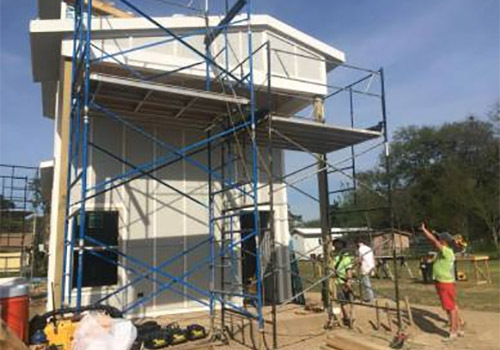 During their break, University of Louisville students worked under the supervision of the local Habitat for Humanity chapter in Lake Sumter, Florida, working alongside students from Ohio State, University of Wisconsin, and AmeriCorps NCCC members. After an initial first-day trip to the beach, the students began work on a local home in Lake Sumter. The home will belong to a family of a deceased military veteran, which, according to volunteer Wesley Turner, made the whole experience more meaningful. “Knowing who we are helping inspired [us] to do more and [will inspire] the community to do more,” he said. 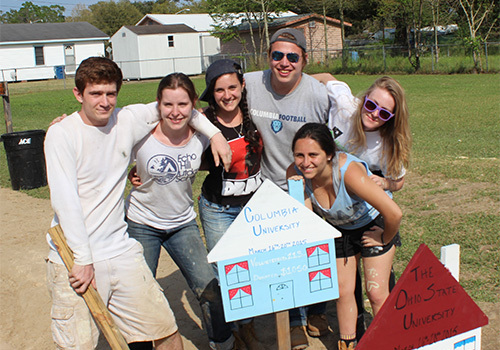 Students from Columbia University pose at their Habitat for Humanity work site in Lafayette, Louisiana. the students spent their Spring Break volunteering their time to help build homes for those in need. Habitat for Humanity campus chapters are student-led, student-initiated organizations on high school or college campuses that partner with local Habitat affiliates to fulfill the four functions of a campus chapter: building, fundraising, advocating and educating. The Habitat for Humanity work site in Lafayette, Louisiana. Since 1989, Habitat for Humanity’s Collegiate Challenge alternative break program has invited students to spend one week working with Habitat affiliates to build homes and improve communities. More than 230,000 college- and high school-aged students have volunteered during their spring break to help build or rehabilitate homes, donating nearly $24 million to Habitat affiliates. For more information on the Collegiate Challenge program, visit habitat.org.